Before you shudder at vinegar in a cocktail stop and think about it. Balsamic vinegar is not a wine vinegar at all. It is not made from wine, but from white Trebbiano grape pressings that have never been permitted to ferment into wine. It is sweet and acidic at the same time and it works wonderfully in bringing out flavors and adding balance to a sweet ingredient. 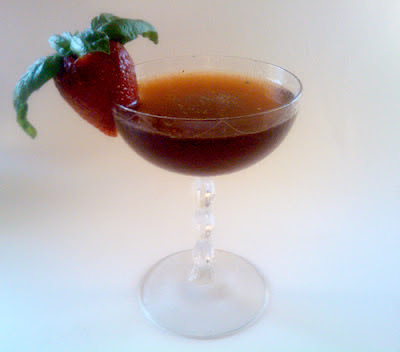 It brings many of the same qualities of a shrub to a cocktail - tartness, sweetness and deep, rich flavor. It was, in fact, a salad with fresh strawberries that inspired me to try making this cocktail and I'm very glad I did! Like Mikey said in those Life Cereal ads, "try it, you'll like it!" Purchase the full sized recipe card here.